Winifred Atwell’s vogue was particular one. Her best remembered song is probably Black and White Rag, the theme tune to the snooker programme Pot Black. Doubtless a generation hooked on the televisual baize tapped expectant feet to the sounds of Atwell’s jangly whorehouse piano. I know I did. That whorehouse piano must have been a studio creation to summon up a bit of back room exotica for ration-starved Britain and it was something Decca did again and again, as you’ll hear throughout the medleys and pop hits enshrined in this thirty two track compilation. It takes a certain kind of masochistic stamina to listen in one go and I wouldn’t advise it. Atwell and Decca struck pay dirt in October 1951 and the formula remained largely unchanged for the rest of her recording life. 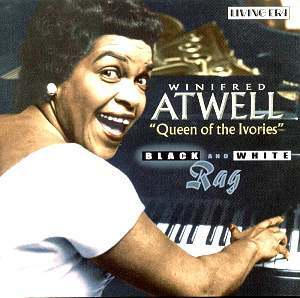 And yet Atwell, like so many purveyors of light music, was a highly accomplished pianist. Born in 1914 in Trinidad she studied in New York with Alexander Borovsky and in London, after the War, with Harold Craxton. However she was simultaneously perusing her enthusiasm for boogie-woogie, a love she shared with the young George Shearing, who was on the point of moving to America just as Atwell was moving from New York to London. Her future was sealed by 1948 and she became an exceptionally popular turn on the stage and on radio. Her Decca recording contract was signed in 1951 and top ten hits followed – she was the first black musician to have a No.1 hit in Britain. Though the hits came – and went – her desire to play classical music never deserted her. She gave some classical concerto engagements with André Kostelanetz and made a recording of the Grieg Concerto with the London Philharmonic with Stanford Robinson conducting. You can hear it on Dutton/Vocalion CDLK 4285 coupled with a dozen solo items – Chopin, prominently, and Rachmaninoff. The same company also offers her Rhapsody in Blue and Hall of Fame recordings - Dutton/Vocalion 4177. Her lighter self though is well catered for in Living Era’s selection. Bright, uncomplicated and uplifting they’re a tonic for a windswept day. She can be jovial and showy, as in Cross Hands Boogie, and she can show us her fine touch and sound technique, as in Jezebel. For all the boogie gimmickry she clearly found the time to keep up a secure practice regime. Naturally some (overdubbed?) electric guitar grates on the infrequent occasions it’s audible. Ted Heath and his band turn up for an outing – plenty more in the Dutton volume of course. The honky-tonk can get wearing but the occasional splendid arrangements, especially parts of Song of the Sea, add ballast to the vessel. And fans of the jellied eels fun dispensed by Chas and Dave may pause to reflect for a moment on Winifred Atwell’s lasting impression on popular music making. Try this and her classical forays for a rounded picture of a popular and talented artist.